Just recently Chef and I had a re-evaluation of our steak dish (again). This is a dish that we tinker with the most probably. We had been using a very thick, meaty cut of the sirloin that is known by its French term, a ‘coulotte’ steak. After much taste testing (and chew testing and cook testing), we have switched it out to a flat iron cut, a tender muscle that comes from behind the cow’s shoulder blade. This process got me thinking about beef in a broader sense. Three or so years ago (pre-Beech Tree), on my old home-cooking blog I wrote a piece about beef production in Canada; at the time there was an Alberta meat re-call due to E. Coli. Here we are, several years later and again, troubling news from out west regarding beef, this time Mad Cow Disease. Large volume beef production, though generally safe and well managed in this country, is still an industry for which mistakes happen. The bigger the machine, the more likelihood of broken parts. So when it comes to the breeding, raising, slaughter and butchery of large animals like cattle, the smaller the operation, probably the better. At least, that’s my opinion, and I can say this opinion, while not that of an expert, is well-informed – it is my business to know this stuff. The image at the top of this page depicts an Old English Longhorn ox: a handsome animal, no doubt. According to Huw Gott, Will Beckett and Richard Turner, the boys looking after Hawksmoor, The UK’s finest steakhouse, the English Longhorn is the best, nay, the only breed of cattle worth carving into steaks. In their book, Hawksmoor at Home, they dismiss Waygu as soft, squishy and flavourless and the USDA rating of beef to be slapdash. I like these fellows. A lot. In any event, I’ve been thinking about beef lately. Of course, upon first seeing this little sticker, I was glad to see that local beef is being distributed in our grocery stores. It was with some relief to learn that we are geographically close to the source of our beef. However, the thing I found odd about this label was the term ‘corn fed’. I’m not sure how that is supposed to be a selling feature for me. Cattle, like sheep, are ruminants, meaning they have a four-chambered stomach that have evolved to process very tough, fibrous material such as grass, clover and other wild greens that can be found in pastures. This is one of the things that make ruminants such well-suited animals for domestication. They take some serious roughage, plant matter that humans could never digest, and through the miracle of their four hard-working stomachs, can convert this roughage into delicious, buttery meat. These animals also give back; their manure replenishes and fertilize the pastureland, allowing for more roughage to grow. This isn’t even to mention the whole dairy element. Really, it’s a remarkably fruitful cycle. So where does corn come into all this? Well, there is a lot of hullabaloo about this topic. First, we have to understand what this label really means. 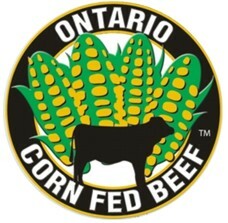 The term “Ontario Corn Fed Beef” is a brand. A brand just like Pepsi or Budweiser. It is a marketing campaign to get people in Ontario to buy beef that is produced in Ontario. According to the Ontario Cattleman’s Association, there are 19,000 beef farms in Ontario accounting for well over 300,000 heads of cattle. That may seem like a lot, but it is actually only about seven percent of the national total. Alberta and Saskatchewan alone account for almost three million heads of cattle. There are more heads of cattle than people in Saskatchewan. That’s a lot of beef. So, it goes without saying that the Ontario beef industry is a relatively small fish in a big beefy ocean. Their challenge: how to compete with the cowboys out west? Here’s an idea: push the local card; cheer for the home team advantage as it were. For that, I am fully supportive of them. The shorter the supply chain and the less kilometers between the ox, the abattoir, the butcher and my plate is better for me and better for the world. So there it is. There are different ways the finishing stage can happen – through large industrial feedlots, or through small, family-run feedlots (and some variations in-between). There is also a vast difference between how soon they go to ‘finishing school’ and how long they remain there. Given Ontario’s typically small farms, our feedlot situation is relatively tame. Because of the smaller scale of production, feedlots are not terribly large and animals are treated more humanely. Feedlots in the U.S. and Brazil on the other hand are nightmares made real. Standing knee deep in their own excrement, hundreds of thousands of cattle spend the whole day gorging on high calorie corn meal with scarcely enough room to turn around. This goes on for miles and miles – mud, excrement and belching, over-fed animals. They are injected with a cocktail of antibiotics and other medicines to cope with the unsanitary conditions and inappropriate diet. Cattle feedlots are now one of the largest contributors to greenhouse gas emissions (yes, we’re talking farting and burping cattle). According to advocate and food writer Mark Bittman, 70% of all antibiotics used in the U.S are actually not going into sick people, but into animals, sick or otherwise. These feedlots produce the kind of high yield, fast growing cattle that ends up in takeout burgers, fast-food tacos and frozen dinners. The thought of eating an animal that existed in such conditions both sickens me and breaks my heart. 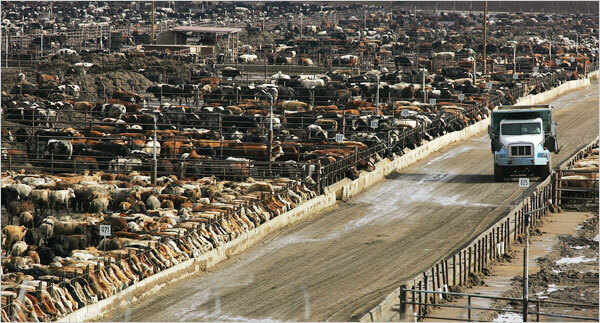 An American feedlot – the photo barely captures a quarter of how large this is. The odor can be detected for miles. So with the feedlot issue behind us, that leads us back to corn. Finishing cattle on richer diets has been done for centuries. Beech Tree hero, Hugh Fearnley-Whittingstall, the ultimate ‘green’ farmer, finishes his Devon Ruby Red cattle on oatmeal and molasses. In Ontario, cattle are finished on corn. One reason why Ontario cattleman are pushing the corn is perhaps a way to differentiate them with Alberta and Saskatchewan. Alberta cattlemen have been finishing their beef with barley for years. So it’s western barley versus eastern corn – a way to distinguish the home team I suppose. The other reason that Ontario has embraced corn as feed is to promote a self-reliant food system. The corn is grown in Ontario and fed to Ontario cattle. No feed imports are necessary and it promotes a concept of ‘terroir’. It is very sound logic to feed a local animal with local grains. A larger question remains; is it sound logic to feed them corn at all? “Because the stomachs of cattle are meant to digest grass, not grain, cattle raised industrially thrive only in the sense that they gain weight quickly. This diet made it possible to remove cattle from their natural environment and encourage the efficiency of mass confinement and slaughter. But it causes enough health problems that administration of antibiotics is routine, so much so that it can result in antibiotic-resistant bacteria that threaten the usefulness of medicines that treat people. The fact of the matter is that cattle should not eat any grain or corn for long periods of time. What it comes down to is the timing. A short term finish of a richer diet provides a layer of fat but does not necessarily adversely affect the health or nutritional output of the animal. This is even done among some small, so-called naturally-raised and artisan beef farmers, for which the cattle will receive corn or other grains for the final weeks of its life. Long term grain feeding in an industrial feedlot on the other hand, is simply not a good thing. Where does this leave the Ontario retail consumer? First of all, if you have a choice, take Ontario beef over any other import first. Most Ontario beef comes from small, family farms that work within our province’s stringent guidelines. Ontario beef farmers also offer up a great variety of cattle breeds and different approaches including organic, pure grass fed, corn fed, corn finished and all variations in between. These are hard working farmers who deserve the respect of us city-folk regardless of our food politics. It’s intellectually lazy for us urban foodies to poo-poo agricultural practices without the benefit of actually talking to a farmer and learning their point of view. Secondly, the best advice I can give, as always, is to go to the source. Most Ontario farms have an online presence. I have talked to local meat farmers via email. They almost always invite me out to their farms to have a look. You can also talk to a butcher. Butchers are a wealth of knowledge. They know where the meat comes from, how to cut it and heck, most of them will give you invaluable advice on how to actually cook it. Grocery stores, Costco and Walmart, regardless of the quality of their meat (or lack thereof), simply cannot provide you the amazing amount of information that smaller butchers or the farmers themselves can. There’s a reason butchers charge a bit more. Lastly, to add to this my angle as the owner of a restaurant (and to put in my own shameless little plug), the Beech Tree only uses beef from Peter Sanagan’s wholesale operation which sources it’s beef from a handful of small, Ontario farms, including West Grey and Ontario Harvest. We go by Sanagan’s exacting standards, which means I don’t worry to much about things like ‘grade’ (which could be a whole other article). I know what I think is best, and that is what I will serve in my restaurant. Personally, as a retail consumer of beef, I avoid imported, feedlot beef as best I can (the occasional McDonald’s visit notwithstanding–guilty as charged). However, neither am I a grass-fed purist. I have found that 100% grass fed has more beefy flavour but it is a little tougher and requires more care when cooking. I have had meat that has been finished with corn and raised humanely which was quite tender and had nice marbling, but perhaps not as high on flavour as the grass fed. I have also had plenty of piss-poor beef, likely raised on massive feedlots. First and foremost, I believe in the strength of small local farmers. I like to stick with ethically and humanely raised animals that have as little effect on the environment as possible. A small Ontario farm that raises grass-fed, corn-finished meat is much superior to anything the USDA might send our way. I even would prefer it over Australian Waygu, which has been shipped half way around the world. If you’re read this far, you’ll now know that these issues are not black vs white…or grass vs corn. 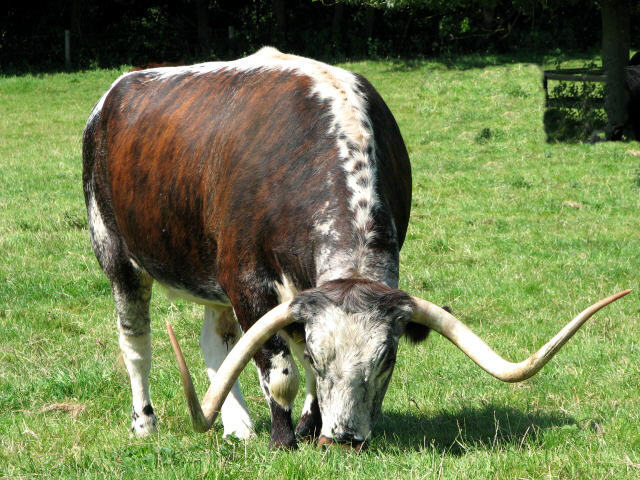 Going back to the opening image of this blog, the beautiful English Longhorn is a heritage breed of cow that is making a big comeback in Britain. (Impossible to source commercially in Canada but a guy can dream, right?) In fact, many long, over-looked and rare breeds of cattle are gaining in popularity across the ocean in the land of the beefeater. Small scale, heritage farming and traditional butchery is experiencing renewed interest. And to think, it only took a near eradication of this most precious of British commodities with Bovine spongiform encephalopathy (otherwise known as Mad Cow Disease) to produce this renaissance of ethical farming practices. Let us hope that the Feedlots of western Canada don’t have to suffer as hard a lesson as Dear Old Blighty did.